I was heading home after a long day when this charming old lady on Blair Road with teal coloured facade embellished with classical motifs and louvered windows fringed by waxy Frangipani leaves jumped out at me. Giving credibility to my artist friends’ claims about my inclination towards a certain kind of sketch subject , that range from lighthearted banter – ‘show her shophouses and she’s all perked up’, ‘Shophouses..well, that’s her middle name‘ to exaggerated assertions like – ‘suppose she was bound, gagged and comatose, I bet she could still land a decent shophouse in her sketchbook‘ , I lingered and toyed with the idea of, well, sketching this shophouse. By the time I put pen to paper, sunlight was licking the last bar of the grilled gate. Construction workers from the renovation site next door had stopped hammering, hung their helmets and boots and were heading back in a group that moved like one composite unit of droopy shoulders and dragging feet. Except a house cat chasing a squirrel, I was alone on the street and the meditative silence brought out some satisfactory linework. I went home and painted it. And then I loathed it, with all my heart. Harder I looked, more limp and lifeless the painting became. Feeding it to the paper shredder seemed like the right thing to do, but I put it away and tried to pretend it never happened. But mistakes happen, more often than you like, in different shapes and forms and turns out you can’t quit the game and press ‘restart’ every time you make a boo boo. You need to step on them to climb to the next level. So I dug this one out after months in exile and retouched it today and guess what – I can finally live with it and move on! 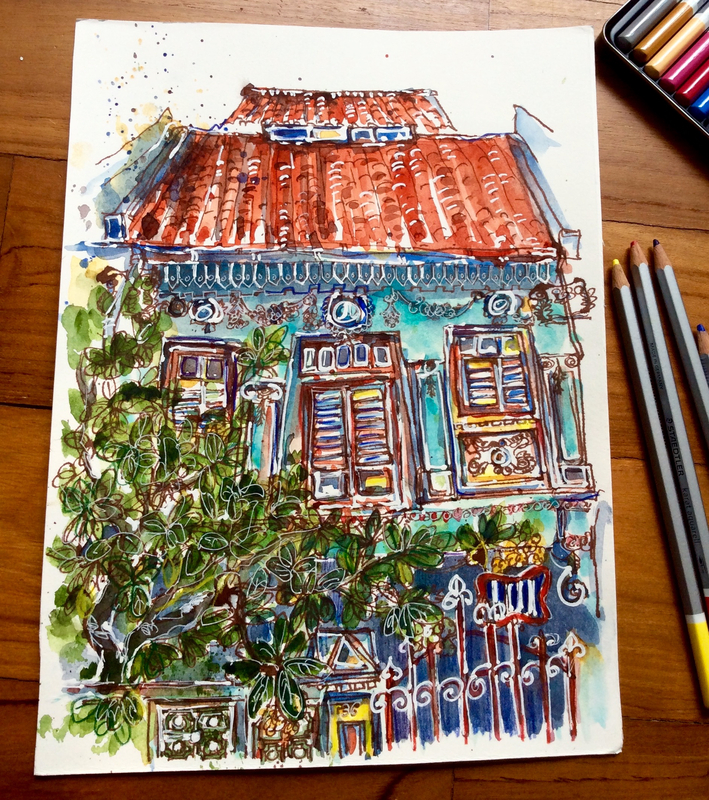 This entry was posted in Daily Vignettes and tagged Blair Road, Blair Road terrace house, gutted, illustration, louvered windows, mistakes, Shophouses, Singapore, sketching, terrace house, urban sketching on September 9, 2015 by Somali Roy. Thanks so much! I love your work too!